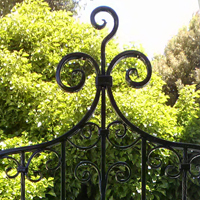 Our San Rafael wrought iron fencing, gates, doors, railings, and ornamental furniture is your one stop shop for superior wrought iron craftsmanship, quality iron materials, knowledgeable staff, timely installation and excellence you can count on. We specialize in custom wrought iron gates, wrought iron fencing, wrought iron railings and everything in between for the San Rafael area! Please browse our Wrought Iron Gallery and see beautiful wrought iron pieces like you never have before. Anything you can imagine we can make a reality, whether you budget is big or small nobody takes care of you like we do. 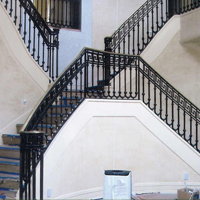 Wrought Iron Fabrications are commonly free of maintenance, however there are some instances where you do need to repair and restore your San Rafael wrought iron fabrications. This could be avoided by frequent small attention. Our company services the repair and restoration of San Rafael wrought iron furniture, gates, fencing, railings and other metal objects. We create custom wrought iron furniture and elegant designer wrought iron pieces in San Rafael that are timeless, and beautiful. Our craftsmanship will supersede your expectations in our custom wrought iron furniture. Our product line of time-honored classics, including custom wrought iron dining tables, elegant wrought iron bedroom pieces, iron custom coffee tables, and much more will give you and unreal home decor experience. Producing quality wrought iron doors using the finest materials while maintaining a safe design! We work with our customers to provide a custom wrought iron door product that is both functional and appealing in their environment. From the most simple San Rafael door to the most intricate, ornate San Rafael door design our attention to detail is never compromised. 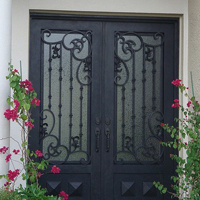 With over 30 years of experience in metal work, our companies Wrought Iron fabrications can guide you to a affordable, safe, and creative door that will last for years. All of our wrought iron balconies are designed in house and we will personally come out and install them with our full service wrought iron certified installation team. 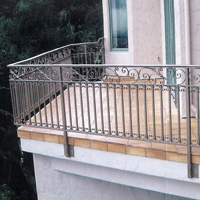 Our San Rafael wrought Iron Balconies are custom built to your specifications. Our designs range from basic to the most detailed and intricate. We can custom design a balcony to meet your structural and aesthetical specifications. 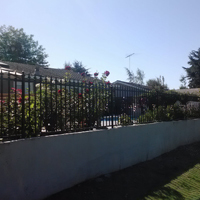 We are your one stop shop for superior wrought iron fencing craftsmanship, quality iron fence materials, knowledgeable staff, timely fencing installation and excellence you can count on. 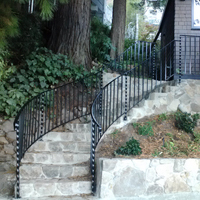 We specialize in custom wrought iron fencing, wrought iron railings and everything in between for the San Rafael area! 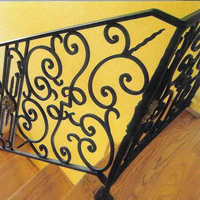 Please browse our Wrought Iron Gallery and see beautiful wrought iron pieces. Anything you can imagine we can make a reality, whether you budget is big or small nobody takes care of you like we do. 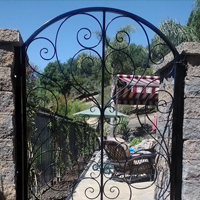 Our custom made San Rafael ornamental steel gates are as sturdy as they are beautiful. Our garden gate design staff will help you decide the best ornamental wrought iron garden gates to complement the landscape of your home. Our wrought iron garden gates provide lasting beauty and will protect your home. We use the same materials to produce our gates as we do to make our iron doors, iron railings, and iron fencing. San Rafael Residential or Commercial Balcony iron Railing, Deck Railing, Porch Railing, etc can really add that extra touch to the interior or exterior of your home,office,medical building,or high rise. 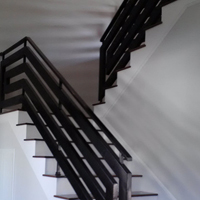 We custom build our railings in aluminum, Iron, Stainless Steel, brass or bronze. With years of experience building San Rafael iron driveway gates we assure you the use of highest quality materials and components, to deliver a beautiful entry iron gate, exit iron gate with fencing. Our company has only the utmost level of professionalism and cost efficiency. 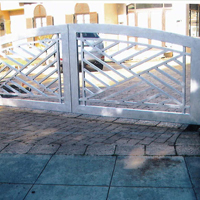 Our company uses state-of-the art automated gate systems/operators with well-known Brands such as: Elite, Liftmasters, Linear, Doorking, Sentex to create your sliding or swinging driveway gate. 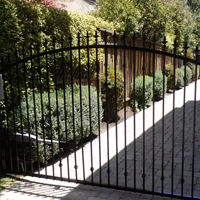 There are many situations in San Rafael where gate openers are highly needed. We like to keep our family safe in San Rafael, and a wrought iron gate opener will do just that!